Harley guards the yard from vicious ladybugs. He is fearsome, can you tell? Firstly, the outside line. I got a simple retractable 15 footer, gently used, on Craigslist. It even came with wooden clothes pins! Strung between a deck post and the plum tree, it’s perfect for our long skinny yard. The dogs are getting used to it. But of course, this is Portland and we have weather here. If I’m really going to nix the dryer, I’ll need an indoor option. I thought about getting a couple of wooden racks, but man! – those take up a lot of precious floor space. A little scheming, a little dreaming, and Damian and I hit upon the perfect solution. Hanging racks! In the ‘nook’ next to the washing machine, suspended above the big dog bed. This was super simple, and really really cheap. We just used 4 rods, attached to the wall with eyehooks and wire. We kept them neutral in appearance, although admittedly, aesthetic wasn’t the driving force here. I think you could actually make them look really neat – like découpage-ing colorful magazine cutouts all over them. Who knows? Get creative, have fun with it! This is my favorite part! I rigged two hangers with some leftover curtain clips I had laying around. Works great for socks and skivvies! What about you guys? What are your creative drying solutions for this monthly mission? This one is a little odd, but we’ve been having pretty hot, pretty dry-wet-dry-wet (etc) weather in the UK, so I’ve been hanging my clothes up outside for the heat…but inside our little greenhouse to protect them from the rain, keeping the door half open so that a breeze can get through. It seems to work! 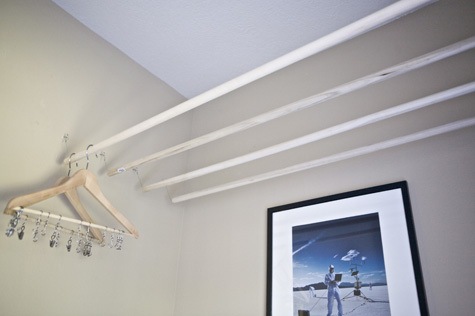 I love your hanging racks though- and such a great idea for limited space! 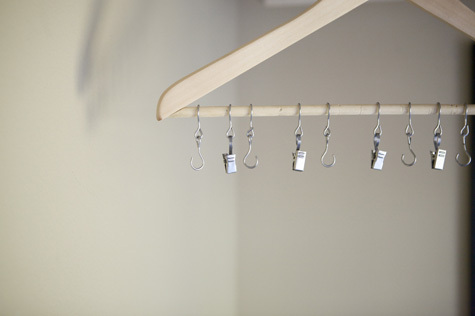 Ooooh, I LOVE the idea with the hangers! That’s going to be absolutely perfect when I move to a smaller apartment in August! So simple and yet so incredibly genius! Thanks! Good idea though, my wife brought something similar, a hook with two plastic squares with plastic clips on, £3.99 from Sainsbury’s (UK). @ Margaretha – Thanks deary, and good luck with your move! Out here in the Columbia Gorge we have a lot of sun, but also a lot of strong (and sometimes dirty/dusty) winds. 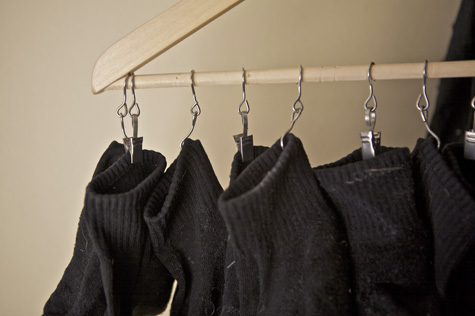 Socks can get lost in the drying process even if you don’t use a traditional electric sock-eating dryer. ;) This indoor option is the perfect solution! I grew up in Pennsylvania in a family with 6 kids, and the only thing my mother ever put in the dryer was sheets. 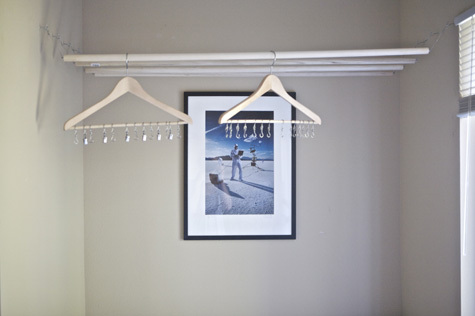 She used to hang clothes on the line in the summer, but in the winter – and now year-round – she uses a system of drying racks throughout the bedrooms of the house for drying. Of course, some of us have grown and moved out since then, but none of us thought there was anything strange about having one or two racks of clothes drying in our bedroom. She insists on spreading clothes and towels out to dry, so every towel went over two dowels on a rack, or a pair of jeans went over two dowels – this helps the air circulate better and probably prevented any sort of mildew smell. The great benefit in the winter is that this was a free humidifer. And in the summer, we didn’t have AC, so the clothes would dry pretty quickly in the heat. I don’t think that the extra humidity in the summer was noticeable. A regular chore for the older children was hanging acres of cloth diapers to dry outside – which we complained about, but really wasn’t a hard task at all. I guess my point is that, unless you expect your bedrooms to look like they belong in a home decor magazine, there’s usually some real estate that can be put to use for drying purposes. Some people would probably complain that air-dried towels can be a bit scratchy, but you can’t beat them for absorption rates! You could dry off with one of those scratchy things in about 10 seconds. We all got used to them. I now live in a tiny studio apartment and – go figure – part of my precious floor space is usually taken up by a drying rack. I have fond memories of both grandmothers and my mother hanging the laundry outside (holding clothespins in their teeth!) 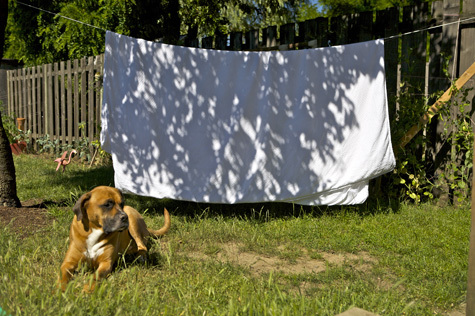 I love the look of clothes drying outside and the fresh scent of sun dried sheets and clothes. That said I resort to my dryer far more than I should. Here’s a tip for people who don’t like the scratchiness of line dried clothes: less than 5 minutes in an unheated dryer softens them up a bit and gets rid of dust that might have been blowing. I promise to do better! @ Julie and Lynn D. – Great tips ladies, thanks!